Postmedia announced a slew of jobs cuts Monday and plans to stop publishing Sunday editions at three of the chain's largest newspapers, the Edmonton Journal, the Calgary Herald and the Ottawa Citizen. Some of Postmedia's newspapers are displayed. The company will soon stop producing Sunday newspapers in three of its largest publications. Postmedia announced a slew of jobs cuts Monday and plans to stop publishing Sunday editions in three of the chain's largest newspapers, the Edmonton Journal, the Calgary Herald and the Ottawa Citizen. "Three of our newspapers [in] Calgary, Edmonton and Ottawa will stop producing a Sunday edition," CEO Paul Godfrey said in a memo to staff obtained by CBC News. The National Post will also stop publishing a print Monday edition through the summer, something it has done in each of the past three years. But the company says it will "look closely at its publication schedule going forward" — something it has not suggested in the past. There will also be job cuts across the chain, but no details were given in Godfrey's memo. "Some roles across our operations will be eliminated," Godfrey told employees. Postmedia employees in at least one newsroom were told layoffs would not start until the fall. The company plans to streamline costs by centralizing a lot of design and pagination work to a Postmedia venture in Hamilton, Ont. 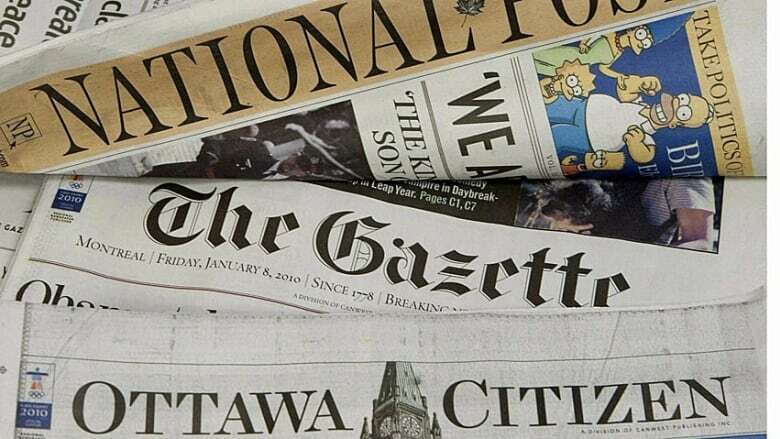 In a memo to staff, Montreal Gazette editor-in-chief and publisher Alan Allnutt said more than 20 editorial positions would be cut in the next few months. "All roles, from managers on down, will be redefined with a digital focus," said Allnutt, who added voluntary buyouts will be offered in most departments. Edmonton Journal editor-in-chief Lucinda Chodan says there will be "staffing reductions" and the company is offering voluntary buyouts to certain employees. A note to staff from a senior editor at the Ottawa Citizen says roughly 20 jobs will be lost. The note also confirms that the paper will be launching a metered model for access to the paper's website and mobile platform in mid-June. "This move will result in lost positions, however the exact number and timing of the transition has yet to be determined," National Post publisher Doug Kelly told Post staff members in a memo. CWA Canada, the union that represents journalists at Postmedia newspapers , said in a statement that cutting jobs is the wrong strategy and will only make things worse in the long run. "We understand that Postmedia is facing financial challenges, but we believe the company can only turn things around by investing in its product rather than by cutting jobs," CWA Canada Director Martin O'Hanlon said. "If we've learned anything over the last few years, it's that cutting jobs only hurts quality, and that does nothing to attract readers or generate revenue." Chris Dornan, associate professor of journalism at Carleton University told CBC News, that Monday's announcement is a "significant move." "Clearly now what’s happening is that the costs associated with actually publishing a paper-and-ink edition of a newspaper is becoming so burdensome that the newspaper industry is trying to rid itself of costs. The problem for newspapers, said Dornan, is that the industry is at a transition. It’s cheaper to publish digital editions, but much of the marketplace still isn’t willing to make that move. Many readers aren’t, and advertisers are also hesitating, he said. "Advertisers are not willing to pay the same advertising rates for electronic distribution as they are for the physical artifact. The industry, Dornan said, "is saddled with two simultaneous expenses. Not only do they have to produce a paper-and-ink version, their also have to produce a digital one." Changes will begin next month when Edmonton stops publication of its Sunday paper on June 24, while Ottawa is scheduled to follow in mid-July and Calgary at an undecided date. The company said earlier this month it was cancelling an in-house wire service, Postmedia News, resulting in the loss of some two dozen jobs, and last month it announced it would charge for content on the Ottawa Citizen, Vancouver Sun and Vancouver Province websites. Its rival, the Globe and Mail announced earlier this month plans for a similar paywall and asked staff to take unpaid leaves this summer in a similar cost-cutting move. In its most recent quarter, Toronto-based PostMedia reined in its losses, while a drop in business from national advertisers dragged revenues lower. Its net loss was $11.1 million in the three months ended Feb. 29. Postmedia was founded just over two years ago out of the restructured newspaper assets of the former Canwest publishing chain. Postmedia’s other newspapers include the Vancouver Province, the Vancouver Sun, the Regina Leader-Post, the Saskatoon StarPhoenix and the Windsor Star, as well as the Canada.com online news and information portal. The cutbacks follow similar moves by several U.S. newspapers, the latest being the Pulitzer-winning New Orleans Times-Picayune, which last week said it would cut publication back to three days a week from seven and cut staff. Should print media be cut to focus on digital?